Arlington's UL/CSA Listed heavy-duty Steel Fan/Fixture Box with fully adjustable mounting brackets installs securely between existing wood I-beams or rafters. The new FBRS40712R fits beams or rafters set 12 to 16 inches on center and complements our FBRS407R pan box, which fits I-beams or rafters set 16 to 24 inches on center. One-Piece Design No Parts to lose. Bracket installation and adjustment screws ship captive. Convenient Fits 1/2" or 5/8" drywall ceilings. The 8.0 cu. in. 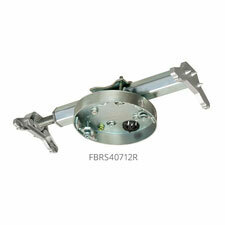 box can be positioned anywhere along the bracket for centering of fan or fixture. (screwed in place until removed by installer).